My current research is concerned with the dynamics of avalanches. 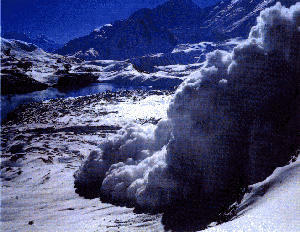 Avalanches are sometimes treated as a special sort of granular flow. These have been studied for a long time but because they can have solids, fluid and gaseous properties satisfactory theories do not exist except in special situations. An excellent starting point is Taguchi's Powder Page. To understand these flows better a series of experiments was started last year of ping-pong ball avalanches on a ski jump in the outskirts of Sapporo. Up to 300,000 ping-pong balls were released from the top of the landing slope and their subsequent motion analyzed using video cameras. These flows are a much simpler than real avalanches but they do have similarities and any model that cannot explain these flows will certainly fail on real avalanches. I am developing a model to predict these kind of flows. The Ping-Pong Ball Avalanche Home Page is currently under development but please try it. For avalanche pictures (including one of 300,000 ping pong balls!) try Kouichi Nishimura's home page. I went with a team from Cemagref to look at the Montroc avalanche in the Chamonix valley on 9th February 1999. A little information and map of the recent avalanche near Chamonix at Montroc.